Did you recently get a new Windows 8 tablet? Are you missing some of your Android apps and games? Today is your lucky day! BlueStacks has announced their Windows 8 app that will let you run some of your favorite Android apps and games in Windows 8 Pro. There’s no RT version in the store, so you can only use it on Pro. They previously had an app for Windows 7 that was a little on the buggy side, but the Windows 8 version looks promising with quite a few more features. They have also optimized it for the hardware in the Microsoft Surface Pro. The latest version includes their special Charms menu that they’ve been able to integrate with Windows 8. 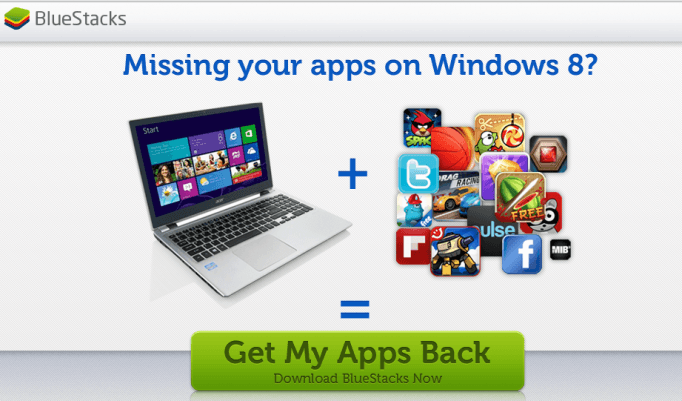 BlueStacks was also able to overcome some hurdles they had in the past. For example, BlueStacks is able to tell the orientation of the tablet and relay that information to the Android environment, making the overall experience feel a little more native. You can download it from their website here. This is a nice addition to w8. Thanks for letting us know. I agree! I tried to install it on this old laptop that I have Windows 8 on but it didn’t work. It gave me a message about my graphics card isn’t known. I’ll be trying it on my tablet tonight though!